From all this I concluded that Levi Hasbrouck was an early, possibly an orginal investor in the bank. He also appears to have had a large stake, perhaps the largest of any of the early investors. By 1861, when a list of shareholders is filed with the county, the number of shareholders has declined from 127 to 64 and he is still listed, and by a small margin, the largest shareholder. It's all interesting but inconclusive, the certificate of the county's earliest bank an interesting artifact, his ownership an indication of his wealth. More importantly the search provided fresh evidence that a broad community is building in support of local research. Every institution and organization I contacted had people to answer phones and questions, who were fluid and familiar with the type of inquiries I made and quick to provide insight, information and suggestions. Also near to the surface is a budding fee based business. This time around only the County Records Center asked to be reimbursed. No one else did although the Huguenot Historical Society indicated future requests for images would incur a fee. This all seems reasonable. Such services are valuable, for many invaluable. In a year or two the custom of charging will have mostly taken hold. The internet is making it possible to plumb the far corners, to find the unfindable, to know the unknowable but this is a fee-based business waiting to happen. The economy is in free fall and interest in research rising. 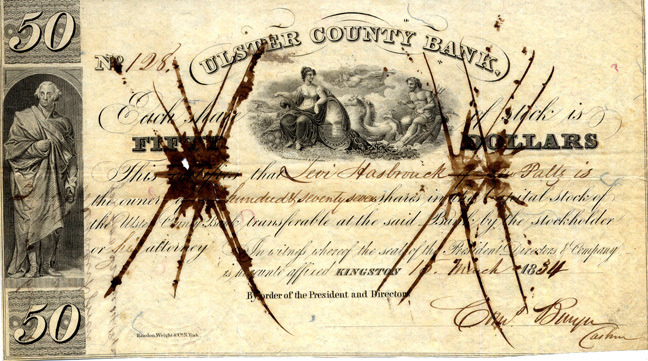 So perhaps it is only logical that the key to future help and research is likely to soon be the twenty dollar bill on whose face the very man, who by campaigning for the closure of the Second National Bank, ushered in the creation of more than a thousand state and county banks, one of which was the Ulster County Bank. That man of course was Andrew Jackson. Huguenot Historical Society. This organization fielded many calls and have provided the image of the Ammi Phillips painting of Levi Hasbrouck. For those interested in the history of the Hudson Valley, Ulster County and New Paltz in particular they are the first stop.